Travelers can score 45% off room only rates plus free breakfast! We’re excited to break out our red, white and blue and honor this important American holiday with a spectacular sale, so while you’re enjoying a few days off to spend time with friends and family, don’t forget to book your next Caribbean vacation at Divi Resorts! Divi Resorts is celebrating 4th of July by offering 45% off room only stays plus free breakfast for 99 hours only. This limited time sale runs from July 2-5, 2018 for travel through December 21, 2018. Divi’s all-suite accommodations are perfect for couples on the hunt for a romantic getaway and families needing extra space to stretch out. Parents should check out Divi’s Kids Stay & Eat Free Program* and kid’s activities, where even the youngest of guests will have plenty to do, without breaking the bank. And since room only stays are priced per room and not per person, solo travelers can also enjoy Divi’s safe, friendly islands, without the added cost. Plus, active and retired Military, Firefighters and Police can save even more with an additional 20% off these incredible rates as a special thank you for their service. Travelers can also enter for a chance to win a free 7-Night Summer Vacation at Divi Resorts. To enter, visit http://www.diviresorts.com/divi-giveaways.htm and enter using the official form by Thursday, July 5 at 1 p.m. ET. 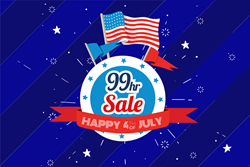 Divi’s Star-Spangled 99-Hour Sale runs from July 2-5, 2018 for travel through December 21, 2018. For reservations, book online at http://www.diviresorts.com/99-hour-sale.htm or call 1-800-367-3484 (Toll-free US) or 1- 919-419-3484 (International). For group reservations, please call 1-800-801-5550 or email groupsales@diviresorts.com. *For more information on Divi’s Kids Stay & Eat Free Program or kid’s activities please visit http://www.diviresorts.com/kids.htm. Parent or guardian must accompany children at all activities.